Is that a moon - or a space station? ...what was our astonishment to find ourselves close to and moving steadily toward the green sphere, and a great door in its side yawning to receive us! From The Heritage of the Earth, by Harley S. Aldinger. The reader might be reminded of the Death Star pulling in the Millennium Falcon in Star Wars. The author does not describe the means by which the craft is drawing others in side, saying only "we were drawn forward by a force not our own..."
Elsewhere in the story, the sphere is described as "the little manufactured planet, swinging through space, bearing its precious burden, the Heritage of Earth." 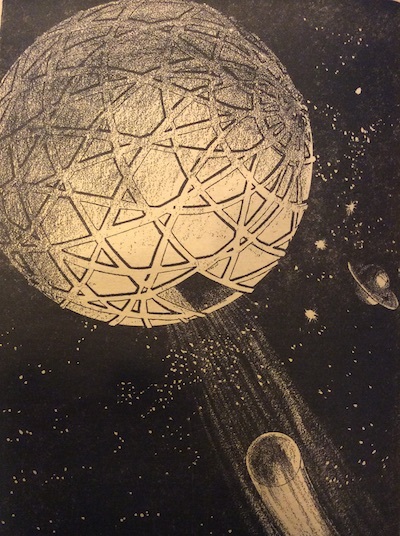 Compare to the battle sphere from The Space Rover (1932) by Edwin K. Sloat and the Transparent Spherical Ship from Schachner and Zagat's 1931 novel The Emperor of the Stars.